Is it already Friday again? Is Friday really almost over? 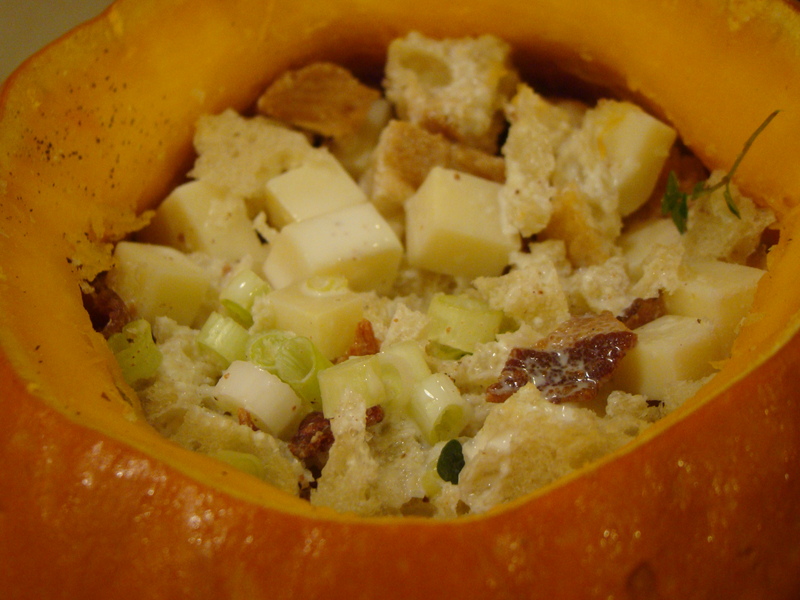 This week’s challenge for French Fridays with Dorie was Pumpkin Stuffed with Everything Good. 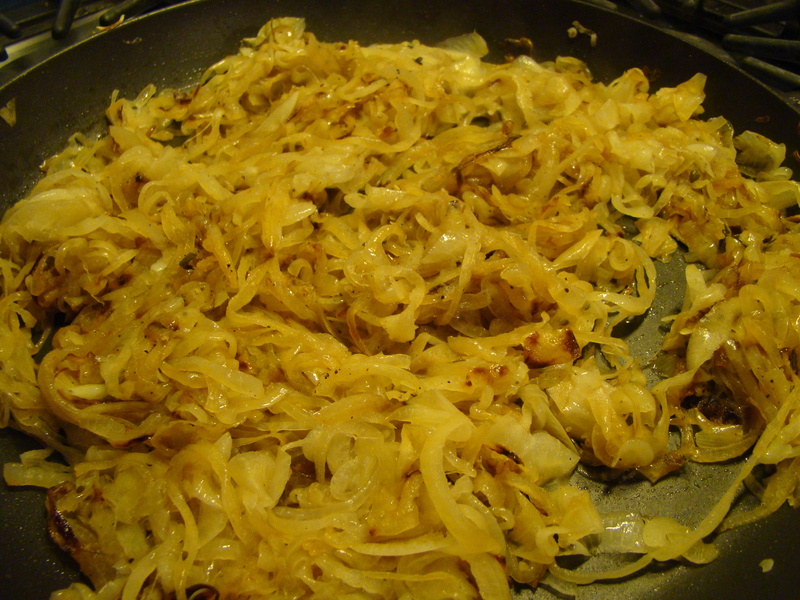 I loved the way this recipe sounded, but I was a little wary because I had tried a similar recipe from Ruth Reichl a few years back which, though it sounded amazing, it turned out flat and flavorless – disappointing to say the least. Melissa Clark also mentioned a Cheesy Baked Pumpkin in In the Kitchen with a Good Appetite, which I read over the summer, so this sort of recipe was on my mind. I’ve never been one to give up on a delicious sounding idea, so when this recipe turned up on the list for this week, even though this recipe sounded similar to my previous failed effort, I wasn’t discouraged. It was challenging for me to fit making this week’s recipe into my schedule. I wasn’t able to make it over the weekend, and with a 2 hour bake time, and wanting to eat dinner at a reasonable time, I wasn’t sure how to make it work. I ended up dicing up ingredients on Night #1, stuffing and baking the pumpkin on Night #2 and reheating said pumpkin in the microwave on Night #3. Not ideal, but it kept me in the game. I have to say how surprised I was at how SMALL a 3 pound pumpkin is. Maybe mine was small because it was extra dense. I know that I couldn’t cut off the cap with any of several substantial kitchen knives I tried. I ended up using the little saws that come with the kits at the grocery store for carving fancy Jack-O-Lanterns. And, I broke two of them. Mine was one tough pumpkin. I didn’t stray from Dorie’s suggestions for the filling: stale bread, diced Gruyère, crumbled bacon, thyme, scallions, and garlic. This went into the hollowed out sugar pie pumpkin and was doused with nutmeg-flecked cream. See what I mean about sounding amazing. The filling was about twice as much as would fit in the cavity (I told you it was small). I put the remaining mixture in an oiled shallow baking dish, poured cream over it, covered it with foil, and baked it alongside the pumpkin for an hour. My (small) pumpkin only needed to bake for 90 minutes for the flesh to become tender. The sides were actually still quite stable and upright. We had already eaten dinner while it baked, but I did sample the baked filling in the dish. It was crusty and cheesy and delicious. Tonight, we ate the actual stuffed pumpkin for dinner. It was much better than my earlier failure, but I’m not in love with it. I’m thinking that if I try it again, I might dice up the pumpkin, or perhaps an easier-to-peel winter squash, combine it with the filling, add some cream and bake it like I did the extra filling for a hearty side dish. I might have mentioned before how much pleasure I get out of cooking something good to eat from the discarded elements of a dish. I make applesauce from peels and cores, and, of course, there’s stock from vegetable peelings or chicken bones. For a snack, I tossed my pumpkin’s seeds with olive oil and a little za’atar and roasted them for about 15 minutes. Yum! 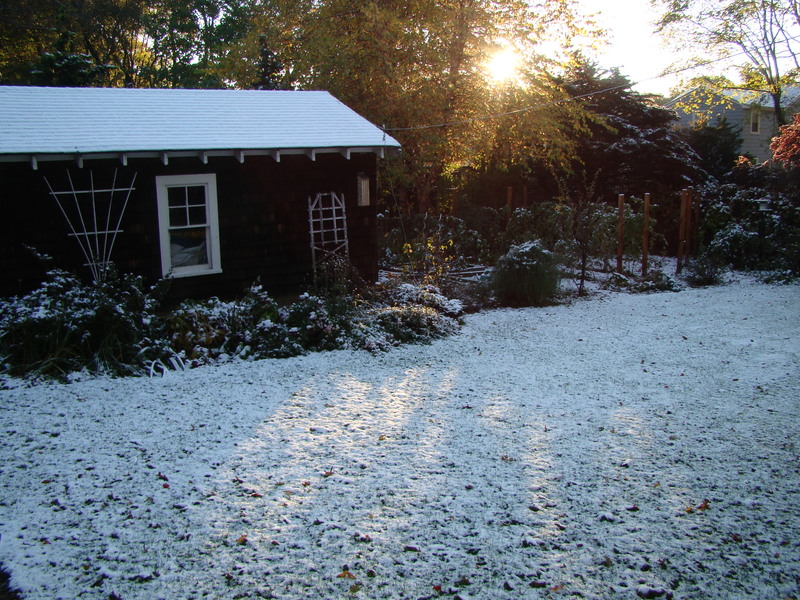 Finally, I wanted to mention the surprise October dusting of snow we got last night into this morning. It was gone by the end of today, but unusual nonetheless. Why do they call it Global Warming? We haven’t even had our first frost yet this fall. Climate Change seems to be the better term. 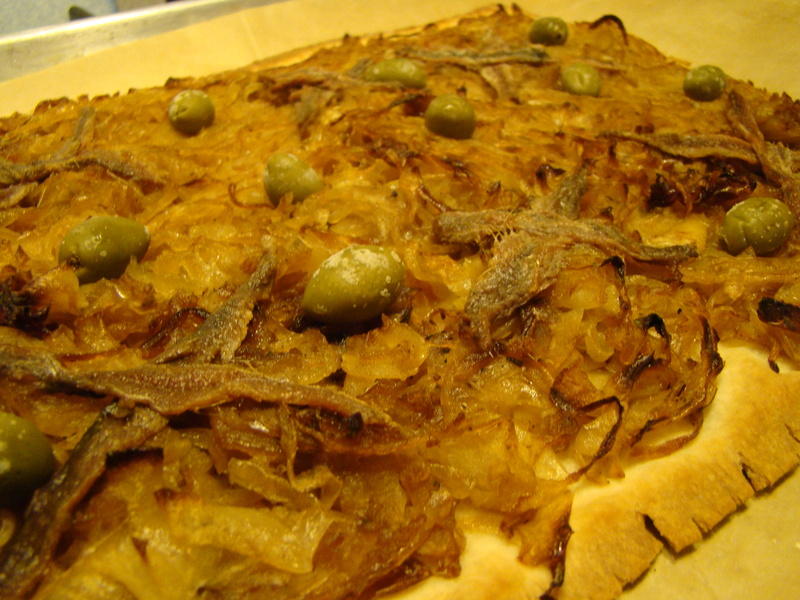 I love caramelized onions, so when I saw this onion, anchovy, and olive tart on the French Fridays schedule, I was excited. Dorie said not to rush the onions. 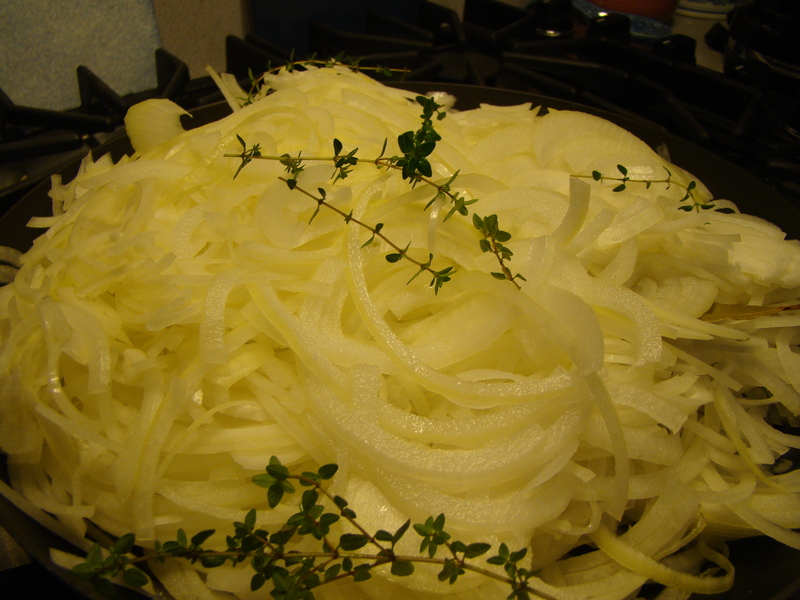 Fortunately, I was making the onions the day before, not for the next meal, so I could let them take as long as then needed. She said they could take 45 minutes or more. 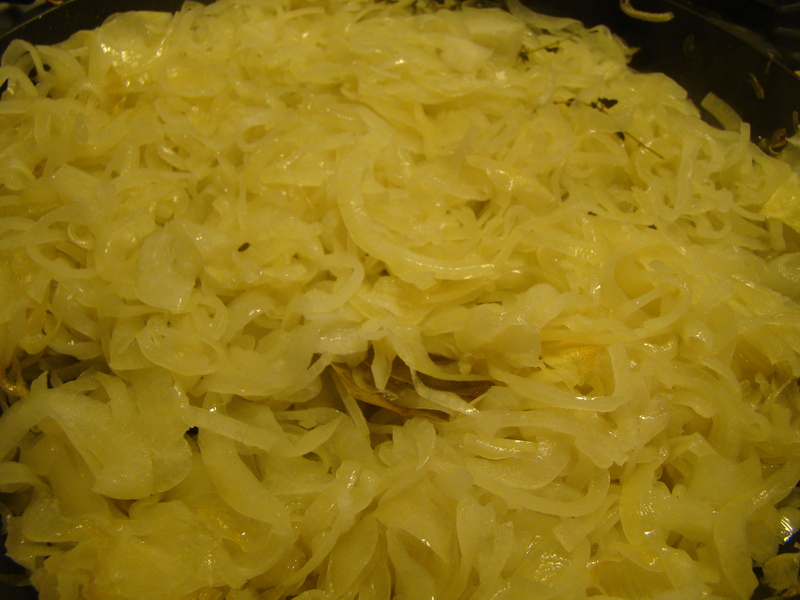 My onions didn’t really show any “action” for over an hour. It took them two full hours to get golden. I took a shortcut with the crust. I was trying to pull this together during the week and the timing on the yeast dough just wasn’t going to work. 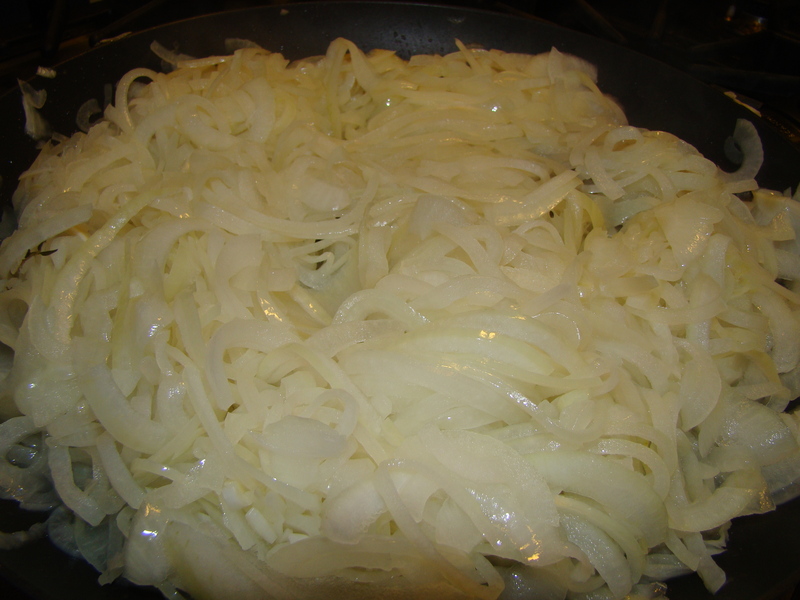 Dorie mentioned that some people, chefs included, will make pissaladière with puff pastry. I had some in the freezer, so I went that route. I let it thaw in the refrigerator while I was at work. Then, I rolled it out to a larger rectangle to top and bake. I also didn’t read the recipe very carefully. I spread the onions all over the top of the crust. Then I decorated it with anchovies and strewed green Picholine olives on top. Then I baked. While the tart was baking, I noticed that the recipe said to bake the onions on the crust and to add the anchovies and olives at the end, giving those ingredients just a brief visit to the oven to warm them up. Oh, well. It might have changed the texture a little, but I definitely didn’t ruin it by my lack of attention to the details. The pissaladière made a nice light dinner and, as leftovers, a nice lunch too. 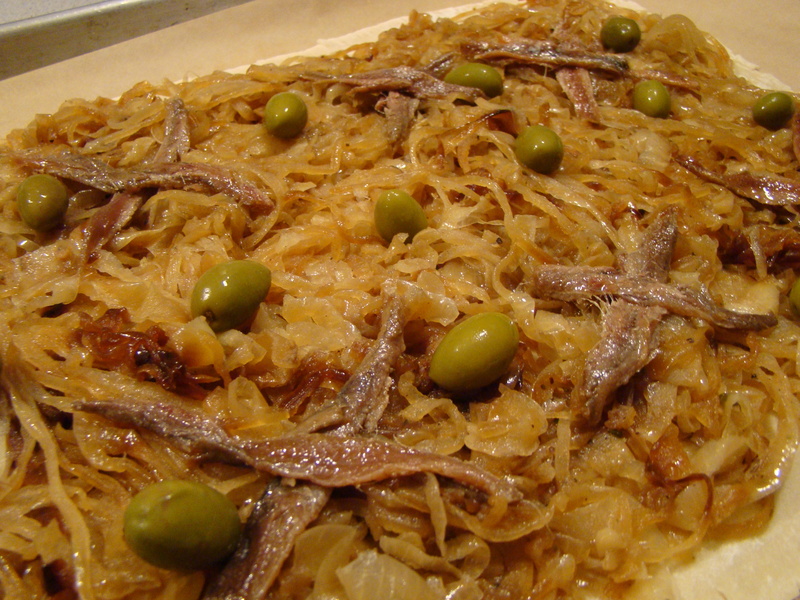 I loved the contrast of the sweet onions to the salty anchovies and olives. My only disappointment was the crust, and that was my own doing. I want to try this again with the yeasty dough. While it was easy to use the puff pastry, it seems that the brand I used (a butter-based puff pastry from Trader Joe’s) isn’t meant for further rolling. It didn’t puff and was more like pastry crust. I used the second sheet for something else last night, without rolling it, and it puffed just beautifully. Because of the anchovies, I suspect there will be varied comments from other Doristas. You can check out what they have to say about their pissaladières at French Fridays with Dorie. If you’d like to make this yourself, I can’t give you the recipe, but you can find it in Dorie Greenspan’s bookAround My French Table. And you can play along any Friday.